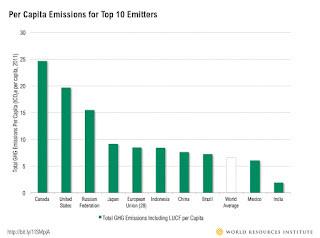 According to UN data, the most profligate producers of carbon dioxide are in oil-rich Trinidad. Annual emissions there work out to almost 38 tons per person. That’s more than double the US rate of 17.5. Of course there are 320 million people in the USA compared to 1.3 million in this Caribbean island nation. France annually produces less than 6 tons of carbon dioxide per person. Also at the high end of carbon pigfulness are other oil producing countries Kuwait (34) and the UAE (22). Saudi Arabia is sixth with 17 tons per year. All these figures are per person. If we look at total volumes of carbon dioxide that are responsible for heating up our one-and-only planet, we get a very different perspective. Because there are so few living in Trinidad, Kuwait and the UAE, they don’t weigh in too big in the global picture. Considering only the top ten world carbon emitters, the World Resource Institute informs us that the USA (in WRI data closer to 20) and Canada (close to 25) clearly have the highest per capital rates, with Russia a distant third. WRI says North America is in the lead in destroying our ecology. North America gets the Pigland award! 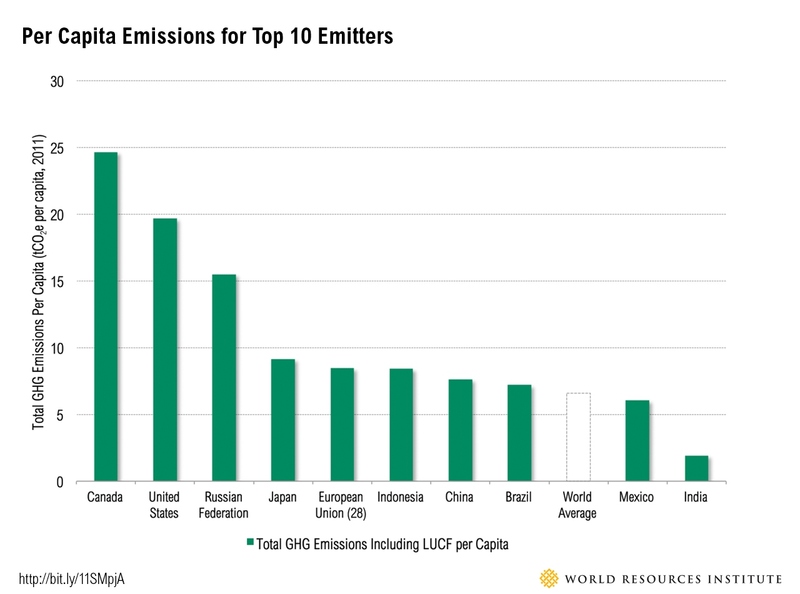 Canada and the USA carbon-pollute at more than twice the rate of the next four -- Japan, Europe, Indonesia, China and Brazil -- all hovering between 7 and 9. Transportation accounts for 20-25% of carbon emissions. We have our work cut out for us. Podcars, if nothing else, will be electric. We can make a difference.